There are recently significant discussions about the increases in pedestrian deaths across America (See recent new links at end of post.) . I don't have data on pedestrian death and injuries in the city of Bellingham or Whatcom County . However, Bellingham publishes a subset of daily police activity. (For additional links, please see Appendix far below.) Collisions are a significant number of all reported police activity. Not all collisions are necessarily reported to COB Police. When they are reported, they are categorized by one of four buckets. The data below is for the years 2017:2019 (3/23/2019) to date. I have left the rdata.table code in place. Some relevant links on highway fatalities and safety from COB, FARS, NHTSA, GHSA, WSTC, WSDOT are far below. Information on COB Transportation Planning is here. Information on funding for COB multimodal improvements are here. This post may not display well on a cell phone. To see the referenced blocks, try using Google maps as referenced (e.g. "3900 BLK MERIDIAN ST, Bellingham, WA"). I also recommend Google Earth Pro. 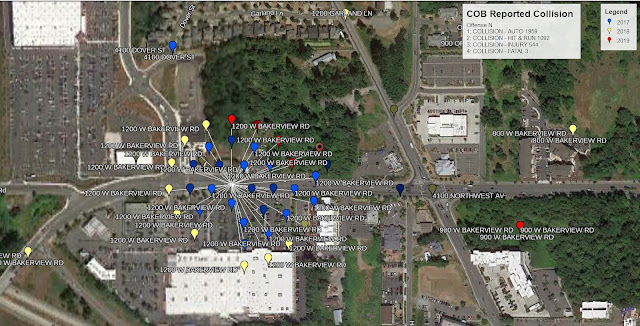 Some approximate locations for City of Bellingham, WA reported collisions for 3900 Meridian Block (Bellis Fair offramp) and 1200 W Bakerview Block (Fred Meyer parking lot) for the years 2017, 2018, and Q1 2019 (3/23/2019 to date). Not all accidents are shown. Click to enlarge charts. The table below ranks by descent the top ten "Collision Locations" for the category "COLLISION - AUTO". The table below ranks by descent the top ten "Collision Locations" for the category "COLLISION - HIT.RUN". (1) Decreased price of gas + easy credit plus + economy equals more cars on road. (2) Increased opiod/legal marijuana/more local breweries equals less attentive drivers/pedestrians. (3) Increased promotion of urban density equals more bicyclists and pedestrians on 'local roads'. (4) Aging population with increased incidences of AD, MS, Parkinsons, Frontal Lobe Dementia, and other neurological diseases . (5) Depressed population on ever increasing dis-inhibitory SSRI loads (e.g. anti-depressants). (6) More impoverished and environmental conscious millennial generation eschewing bus and cars for bikes and walks.